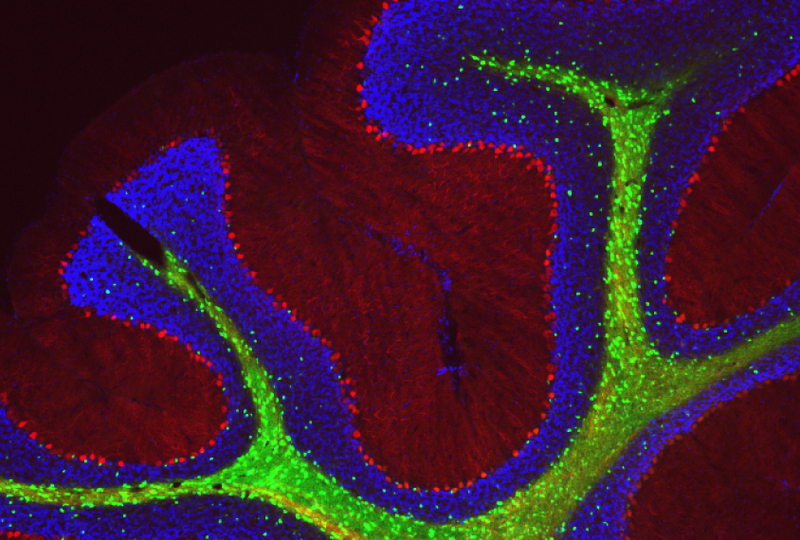 Big loss: Loss of Purkinje neurons (red) in the cerebellum may underlie social difficulties in mice missing an autism gene. Two studies published in the past two months provide new clues to when and how a brain region called the cerebellum contributes to features of autism1,2. Specifically, the cerebellum is involved in early life in developing cognitive and social abilities, the findings show. The cerebellum has traditionally been known for controlling movements and posture. Postmortem studies have found that the cerebellum of autistic people has unusually few Purkinje neurons, which connect the region to other brain areas. The new studies add to mounting evidence that the cerebellum also governs language, cognitive and social development. Autism may involve alterations in any or all of these skills. One of the new studies shows that temporarily inactivating certain parts of the cerebellum in juvenile mice — but not in adult mice — results in inflexible behaviors or social impairments reminiscent of autism. “There’s a period of time when that region’s activity is necessary for the rest of the brain to organize cognitive and social behaviors,” says lead investigator Samuel Wang, professor of molecular biology at Princeton University. The second study suggests that despite this early role, the window for easing problems with the region is wide: Treatment can reverse the social deficits up until young adulthood, at least in mice missing an autism gene called TSC1. “The evidence up to this point suggested that you would need to have really early treatment for things ever to be effective,” says Peter Tsai, assistant professor of neurology at the University of Texas Southwestern in Dallas, who led that study. Wang and his colleagues injected synthetic receptors for an experimental drug into each of five regions of the cerebellum in 21-day-old pups, the mouse equivalent of childhood. They then gave the mice the drug in their drinking water until the mice were 56 days old. The drug suppresses the activity of a subset of inhibitory neurons called molecular layer interneurons, which dampen brain activity. And this enhances the activity of Purkinje neurons, which are also inhibitory, resulting in a net suppression of the region. “We’re reducing the ability of those parts of the cerebellum to influence the rest of the brain,” Wang says. The team saw that inhibiting either of two regions, called Crus I and Crus II, leads to social behaviors reminiscent of autism, making the mice indifferent to other mice. A study last year showed that Crus I is disrupted in children with autism. Inactivating a third region, called lobule VI, leads to inflexible thinking: The mice learn to find a hidden platform in a container of water but have trouble finding the platform after it is moved. Inactivating the same regions in 42- to 48-day-old adult mice has no effect on social interactions and only a slight effect on learning, however. The researchers then injected mice with harmless viruses that enable them to trace brain connections. They found that Crus I connects to the anterior cingulate cortex, which in people plays a role in emotion and ‘theory of mind’ — the ability to understand another person’s beliefs and intentions. It also connects to the somatosensory cortex, which processes sensory information. Lobule VI connects to the prelimbic and orbitofrontal cortices — regions involved in decision-making. The findings were published in September in eLife. “These regions are important for a lot of the behaviors [seen in the mice],” says Emanuel DiCicco-Bloom, professor of neuroscience, cell biology and pediatrics at Rutgers University in Piscataway, New Jersey, who was not involved in the study. Tsai’s study offers some hope of easing these behaviors. The team studied mice missing TSC1 only in Purkinje neurons. Mutations in one copy of this gene cause tuberous sclerosis, a condition characterized by benign tumors and developmental delay. About half of people with tuberous sclerosis also have autism. In a 2012 study, Tsai and his colleagues found that mice missing both copies of TSC show autism-like traits, including social deficits, restricted interests and repetitive behaviors, by 2 months of age3. The Purkinje cells in the mice fire less frequently than those in controls and begin to die by the time the mice are 6 weeks old. That study also showed that a drug called rapamycin prevents the cell defects and autism-like behaviors when given to the mutant mice starting at 7 days of age; rapamycin is in clinical trials for treating tuberous sclerosis. In the new study, Tsai’s team tested rapamycin’s effects in 6-week-old mice. After four weeks, the mice no longer show social deficits. The treatment also normalizes Purkinje cell firing and prevents loss of the cells; it has no effect on restricted interests and repetitive behaviors. The same treatment given at 10 weeks of age does not prevent Purkinje-cell loss or improve social behavior in the mice. However, it does reverse social deficits in mice missing only one copy of the gene; these mice do not show any Purkinje-cell loss. The results appeared 9 October in Cell Reports. The results hint that social behaviors in autism are amenable to treatment even in adulthood, Tsai says. The team is trying to identify the brain circuits responsible for social behaviors. They are also trying to understand why rapamycin does not ease restricted interests and repetitive behaviors.